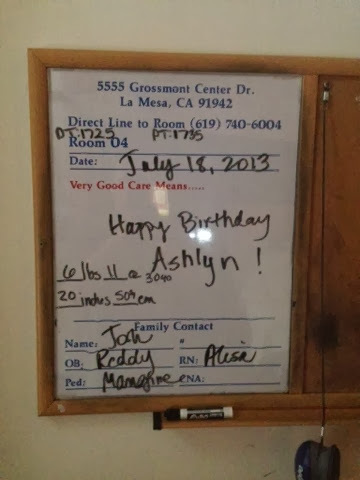 On Saturday, June15th, 2013 I felt the first contraction. The first of MANY contractions. 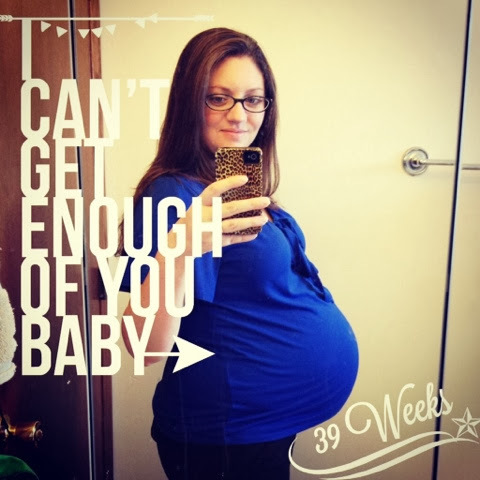 I was only 36 weeks along, but it truly felt like a real contraction. It started in the car on the way home from doing laundry at Josh's parents house. When a second one hit 20 minutes later I got a twinge of excitement! This went on for a whole hour, but instead of increasing in strength, they were getting weaker with each one. This was the first night of Prodromal Labor contractions. They would come on every single evening around the same time. Some of them strong enough that I had to stop and breathe through them. I got my hopes up many times in those last few weeks. Every time they would weaken over the course of a few hours and then just stop. It was such a frustrating thing to go through. Never knowing if they would lead to anything... I had no idea if I would even know when the real thing would happen! Week 37 came and went... week 38... week 39... week 40... Ok, baby, any day now! Nothing. Just more Prodromal Labor. 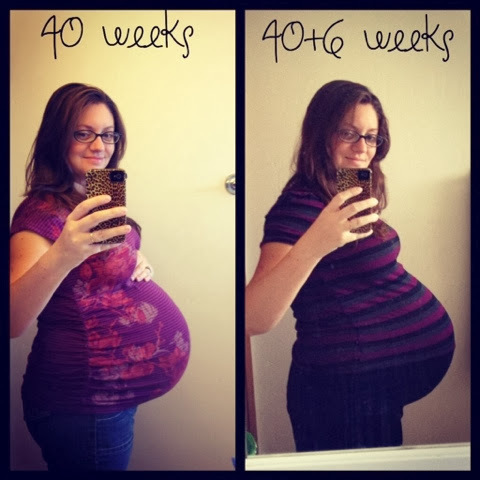 At my 40 week appointment I told my doctor that I would not be scheduling an induction because I just knew that my body would do what it needed to do. That my baby would come when she was ready. Everyone said they thought I was looking a lot lower. Yay! Getting closer! 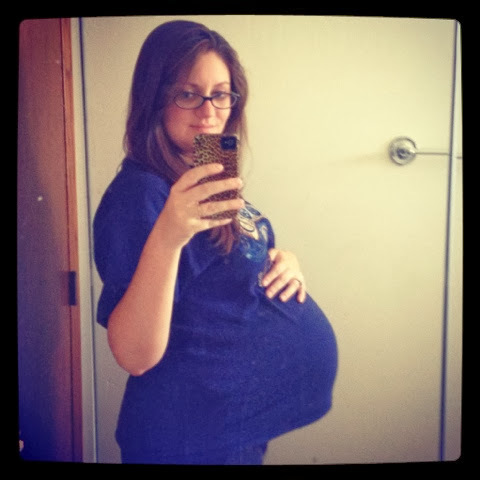 That night I went through more prodromal labor contractions... I was used to it by then and just ignored them. 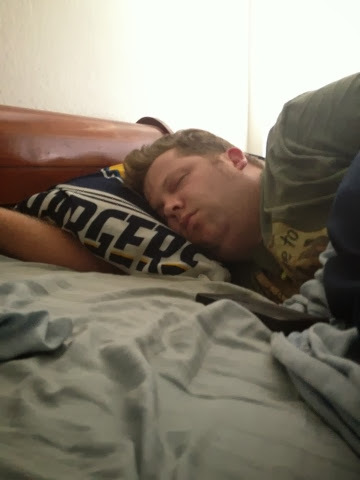 I put my boys to bed and laid down with my hubby. 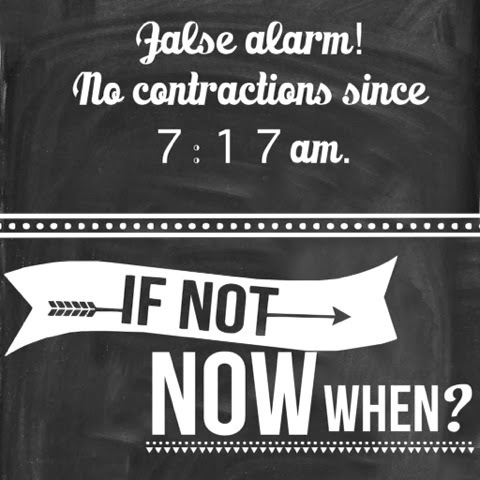 At around 1:30am on Thursday morning I woke up to a contraction. Great. More stupid prodromal labor... Just let me sleeeeepp! When I didn't feel another one come on I fell back asleep. At 3:02am I woke up to another one. This time it was a lot stronger. I woke my hubby with my moaning. He asked me if I was having a contraction... Umm... That would be a yes. I turned to him and said, "You might be calling in to work today..." He asked me why. "Because we might be having a baby today!!" I really didn't think this was the real deal just yet and I have no idea what made me say that. I told him to go back to sleep and I would let him know if I had any more. Well, another one came... And another. And another. I decided that I should start timing them. Or at least making notes. At around 6am I sent a text to my mom telling her that I had been having contractions since 1:30am. I told her that I still didn't think this was the real thing, but that I was going to be getting myself and the kids ready for the day just in case. I sent Josh off to work and I took a shower before the kids woke up. I told him that I really didn't think this was *it*, but that I would call him if things got worse. 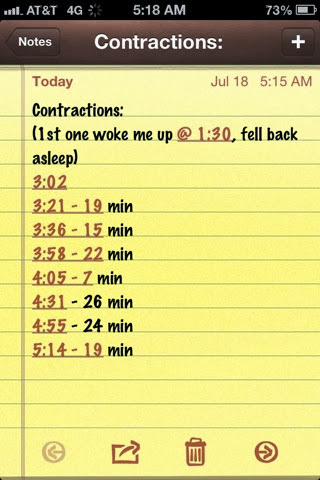 During my 20 minute shower I felt 2 more weak contractions... Ok, they're gonna slow down and go away like usual. I sent a text to my mom telling her what I thought. She said that I was in denial and that she was coming over "just in case". A minute later I got a text from Josh telling me that he was coming home and taking the day off. "Just in case". I told him to please not come home. That it would just be a waste of time. At this point I didn't have a single contraction for a whole hour. I got everyone's hopes up for nothing. I called my mom and told her that it was a false alarm and that josh was coming home so she didn't have to bother coming. And then a contraction like no other hit. It took me down to my knees in my kitchen. I had to breath through it and I couldn't say anything to the boys. Okaaaay... Maybe this WAS it. I called Josh and told him what happened and that maybe he should come home after all. Just in case. I was still thinking that they would stop and it would be yet another false alarm. The contractions continued... I called my mom back and told her that Josh was coming home and that we were going to take the kids to her along with their overnight bags. Just in case. The car ride was awful! More contractions were coming and a few of them were really intense. It was pretty hard to sit in the car through them. After dropping off the kids and their stuff we headed into Josh's work to talk to the front office ladies who were all really excited for us. I told them that I still didn't think this was the real thing and that Josh would be back the next day. They told Josh to take me to an air conditioned mall, feed me lunch and walk with me. It was really hot out that day and some a/c sounded nice. So we headed to the mall to walk the baby out... While we were there I noticed that Josh had left my hospital bag at my mom's house and we had the boys backpack in the car. Oops. 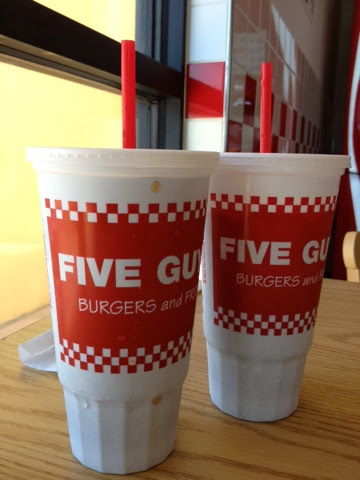 We decided to get something to eat before we headed back over to trade the bags. 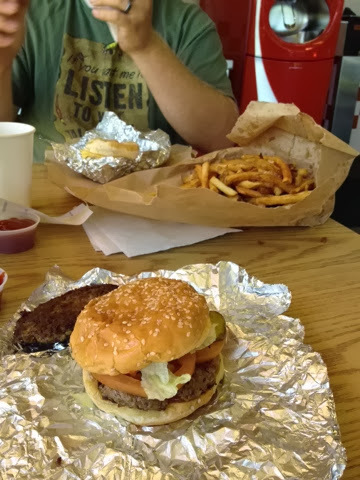 Mmm... We stopped at the new restaraunt there - Five Guys. It was so good, but there was no way I could finish the whole thing. No one even noticed that I was sitting there having labor contractions... They were getting closer together and more intense. After we took the bag back to my mom's house I wanted to head home to try to take a nap. We had been up since 3am and were exhausted. Back at home I tried laying down to rest, but I was too uncomfortable to sit still. I was also keeping Josh awake with my tossing and turning. So I went downstairs and starting bouncing on my yoga ball while updating everyone on Facebook. My contractions started picking up all of sudden and the yoga ball just wasn't cutting it any more. I found relief by getting down on my hands and knees and rocking back and forth. With every new contraction I was having to breathe through them and concentrate. They were still about 30 minutes apart. I couldn't imagine how intense they would be when they got closer! These were already barely manageable. I went upstairs to try laying down again. Josh was asleep...but not for long. While laying down I had a the most intense contraction and couldn't move. I was moaning so loud that I woke Josh up from his nap. I told him that maybe we should head in to the hospital. Just in case. 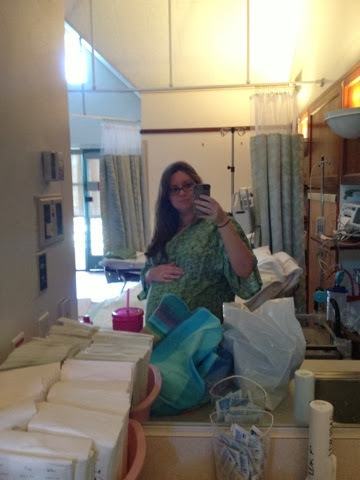 Right before we left, my contractions were suddenly coming 5 minutes apart! Ok, so maybe this WAS it! That last contraction at home was long and so intense. I started thinking about an epidural right then and how badly I wanted one! Josh rushed me over to the hospital and walked me inside. By this time it was just after 4pm. I signed in and they took me to a triage room to get checked out. Josh left to go park the car in the parking garage and the nurse left me in the room to change into an ugly gown. 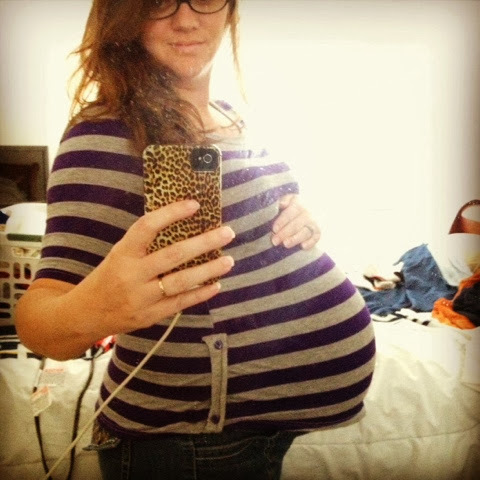 As I was waiting my contractions were continuing to get closer together and so intense. I started panicking because no one was in the room with me. I laid down on the bed and just started moaning through the contractions that kept coming. Finally after what seemed like forever the nurse came back to tell me that a delivery room was being cleaned for me, but wouldn't be ready for a few more minutes. They hadn't even checked me for dilation yet, but I'm guessing that they could tell I was close by the guttural sounds I was making with each wave that came over me. As the nurse was asking me question after question Josh walked in and she turned her questions to him since I could no longer answer them. After the million questions, she checked me. 5cm. Yup, I was staying. I was so excited! This was REALLY it! After I was comfortable again I felt the need to push... As I was pushing my bag of waters popped. So not only did I pee in her face, my amniotic fluid got all over her too. I warned them that it didn't break yet! They should have listened! She then got smart and had the nurse put a face shield on her lol. It was a little late though because with that push my baby's head came through. Another tiny push and her shoulders were out and then she slid right out. Omg relief! The ring of fire is no joke... I felt EVERYTHING. Once she was out I felt completely normal again. No one announced if my baby was a boy or a girl! I just knew this whole pregnancy that we would end up with boy #4 so I HAD to know! Is she really a girl?! That was the first thing out of my mouth... They held her up and sure enough... A perfect tiny little girl was born at 5:25pm. 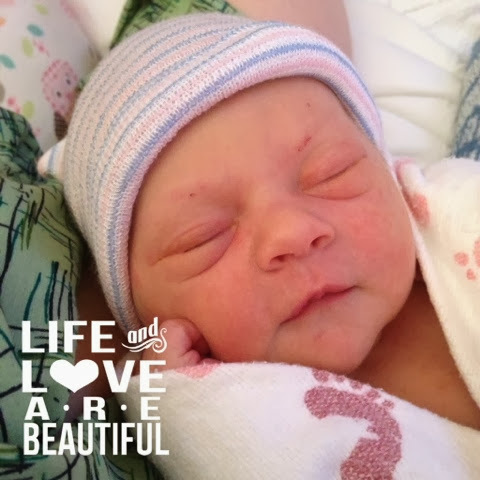 She started nursing within a few minutes of birth. She latched right on and was a perfectly alert nurser. 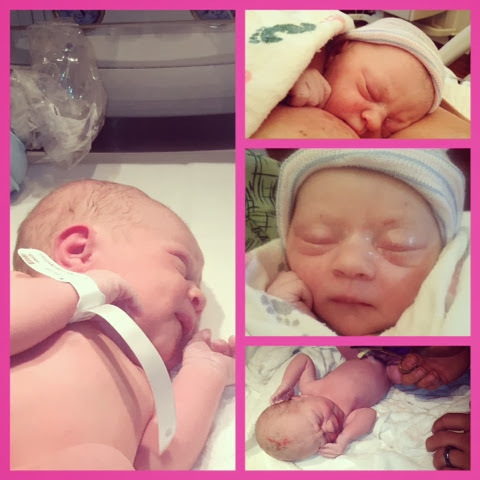 I felt great and was thanking my lucky stars that I arrived too late for an epidural. I was able to get right up out of bed to clean myself off as soon as our first nursing session was done. If I had to do it all over again I wouldn't change a thing. It was the easiest labor and delivery I've had to date.